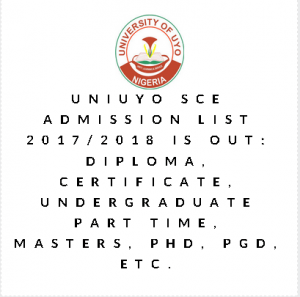 UNIUYO SCE Admission List 2017/2018 IS OUT: Diploma, Certificate, Undergraduate Part time, Masters, PHD, PGD, etc. HomeADMISSIONUNIUYO SCE Admission List 2017/2018 IS OUT: Diploma, Certificate, Undergraduate Part time, Masters, PHD, PGD, etc. The SCE List can be sighted at the SCE Notice Board at the School of Continuing Education and Professional Studies, University of Uyo Town Campus. Successful candidates are require to proceed to pay their Acceptance Fees and Visit their respective Heads of Department, for screening and further directives. More batches of the Admission Lists are expected soon. Pls is primary education or educational planning and administration offered in part-time postgraduate school. Aiit.. Please let me know wen d form is out, tnx. can any one still register for the form? when will lectures started in diploma?